We posted this a little while back on the UK GT-R Forum. 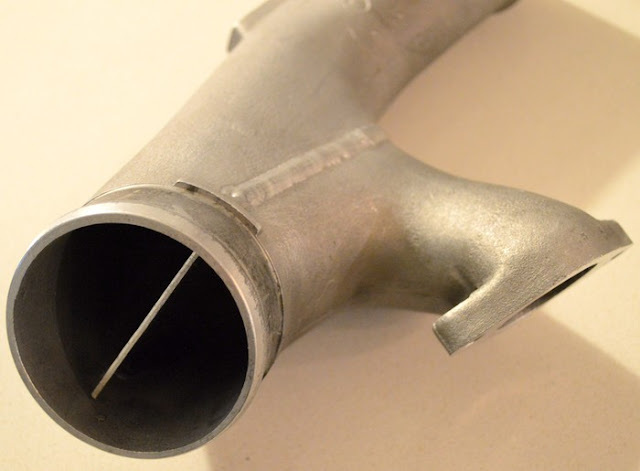 In with keeping with the mostly stock look for Jeffs R32, its going with a twin GT-RS setup, and the stock twin turbo outlet pipe. We have seen some modified pipes in the past, and decided to make one up for Jeffs car. By keeping the front turbo from meeting the rear turbo at such a 90 degree angle, it should help with the balance between the two turbos, and might even help out with power. Jeffs car is still going together, so we decided to test the modified pipe on the orange R33 . The orange car is Stock engine, stock turbos, aftermarket downpipe, exhaust, intake, Apex intercooler, Power FC. The starter on the orange car was starting to click, but it would start about every other time. While dynoing another car, Josh put some more pump gas in it, and pulled the front propshaft so we could run it on the dyno. The last time on the dyno boost was about 14.7 psi and the car did a max of 346 whp. Click though for the test results. 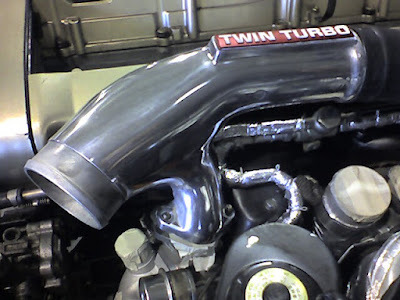 Divided Twin turbo pipe. It is this simple to do.